I heard the news on a Saturday morning in March, scanning the gaming blogs. Target was selling T-shirts bundled with experimental games. Excitement took over - I had to get one. I practically skipped to the elevator. I was still high on the news when I parked the car on 225th Street in the Bronx, but suddenly it felt too good to be true. The blogs didn't post any details on how to get the shirts, and I had no luck on Target's website. On the escalator ride down, I descended into despair. I found a T-shirt with Mario wielding a Donkey Kong hammer with the pun "Let's Get Hammered!" Was I getting close? Canvassing every aisle of Men's Wear, combing the games section alongside kids duping their parents into buying those plastic Wii Sports attachments, I found nothing. The store clerks looked at me quizzically. I went home dejected. 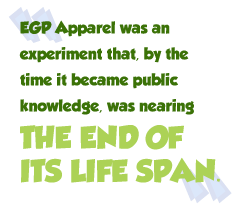 EGP Apparel was an experiment that, by the time it became public knowledge, was nearing the end of its life span. At the helm were Kyle Gabler, Edmund McMillen and Kyle Gray. As I write this, Gabler is the Golden Boy du jour of indie games. Everyone loves World of Goo, developed by his two-man studio, 2D Boy. Critics are still drooling, but more importantly, my non-gamer roommates love it. That begs the ultimate question: How do we get roommates, parents, teachers and anyone who still thinks of videogames in terms of Halo and World of Warcraft to expand their view of the medium? EGP Apparel was supposed to answer this question. "It was basically a way to reach people that wouldn't otherwise know we exist," Gabler said in an interview. All of this began in 2005 with the Experimental Gameplay Project, a collaboration between Gabler, Gray and two fellow graduate students at Carnegie Mellon University's Entertainment Technology Center. They set a goal to design 50 games during their last semester, with three rules: one developer per game, no more than seven days per project and a theme, such as "gravity" or "vegetation," that guides the creation of each game. Every week, they'd upload their results to www.experimentalgameplay.com. When bloggers started posting their scores for Tower of Goo (the predecessor to World of Goo) and commenting on the other games, Gabler was shocked. "We had no idea that people were watching it because we didn't have logs or anything," he said. "But they were." The project took off. There was a speaking engagement at Game Developers Conference, a whitepaper for the industry website Gamasutra and the conversion of www.experimentalgameplay.com into a public prototype space where anyone could post a game if they followed the students' rules. There are over 540 games on the site today. "It changed everything for us," Gabler said. "That's the reason I'm able to do what I'm doing now."